Coconut flakes coated in raw cacao, cinnamon, virgin coconut oil, and a touch of coconut nectar and pink Himalayan salt. Unlike cocoa, raw cacao is a pure, unprocessed and nutrient dense superfood that’s rich in antioxidants, fiber and magnesium. You can also feel good about superfood cinnamon, which is an antioxidant-rich spice that can have positive effects on blood sugar levels, digestion, and immunity. 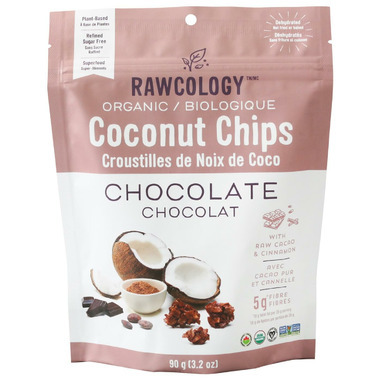 These chips are sweetened with coconut nectar, a raw and low glycemic-index sweetener that’s rich in enzymes. All of their snacks are dehydrated at a low temperature to promote optimal nutrition and flavour. Ingredients: Organic coconut flakes, organic raw cacao powder, organic coconut nectar, organic virgin coconut oil, organic ground cinnamon, pink Himalayan salt. Allergen free. These are SO delicious! 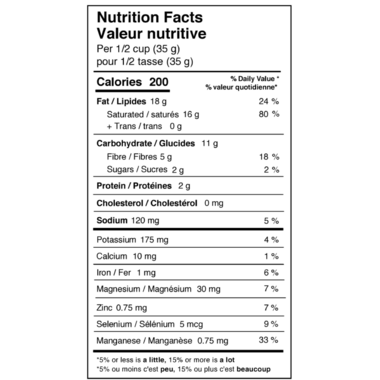 Love that they are only 1 gram of sugar per serving. Impossible to find snacks this healthy AND delicious.